Check out this cool video of our Year 1 pupils testing their water bottle rockets. In the classroom, they looked at different rocket designs before designing their own. When I asked the children if their design was any different to the finished article, I was told "not really - we stuck to the plan!" Not only have they been rocket designers, but Year 1 have also been scarecrow designers! Supported by Ms Hall, a parent volunteer, Birch Class have entered the Royal Horticultural Society's Scarecrow Competition. The school is proudly entering 'Mr. Saturn'. Please take a look! Based on Saturn, the Roman God of Harvest, all of the Year 1 children contributed to the entry. Say hello to Mr. Saturn! Downsview celebrated their love of books last week during World Book Day...and what a fantastic day it was! Everyone (staff included) were invited to dress as their favourite book character; it was lovely to see a range of costumes and hear the children speak about their chosen characters with such enthusiasm. Thank you to everyone at home for supporting the event – the costumes were fabulous! The day began with a ‘share-a-book’ activity giving the children a chance to read with a family member. 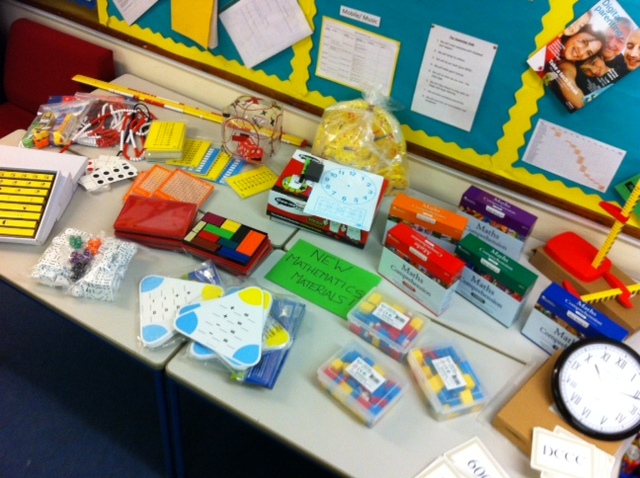 Thank you to all parents and carers who were able to come along and join us. Afterwards, the children attended a special assembly where they were set a writing competition. Each class was given a key text and a mystery envelope. Inside the envelope was either a picture of a character or setting which the children had to include in their own writing. Throughout the day, children explored their key text; planned in detail their writing; role-played in small groups and then used all of the spoken language they collated to write up their terrific stories. Teachers were then given the very difficult task of choosing a winning entry from their class. Every child in the school created a super piece of writing and should be very proud of their entries. The winners of the writing competition can be seen in the photo below. Congratulations to you all! The winner of the Year 5 writing competition was Stefan but sadly he is missing from the photo! Never mind…he still gets to take home a brand new copy of the book on which Year 5 based their writing! Well done! All winners received a brand new copy of the text from the day and their stories have been collated to produce a World Book Day scrapbook along with photographs and quotes. Mrs Selmi should be thanked for her efforts in organising such a great day! Reading is a key life skill used every-day and it is absolutely crucial that all of our children can read, comprehend and talk about the books they read in readiness for the future. 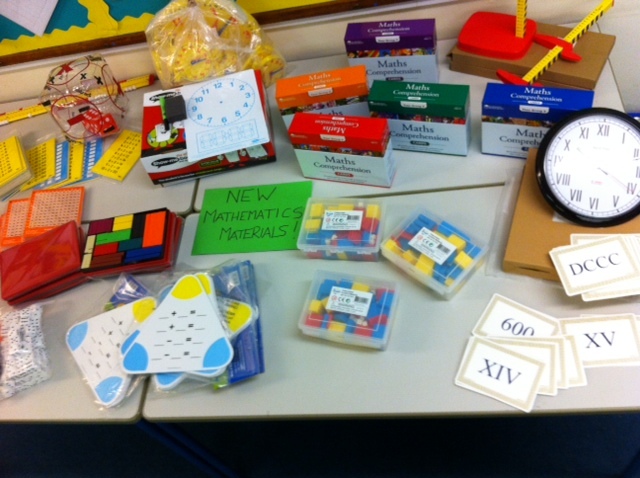 Our new Mathematics resources have arrived! I know this might not excite all of you, but here at school, we're very happy! The new equipment has been purchased to aid children's understanding and progress in Mathematics. Last year, we bought lots of equipment and saw the positive impact almost immediately. 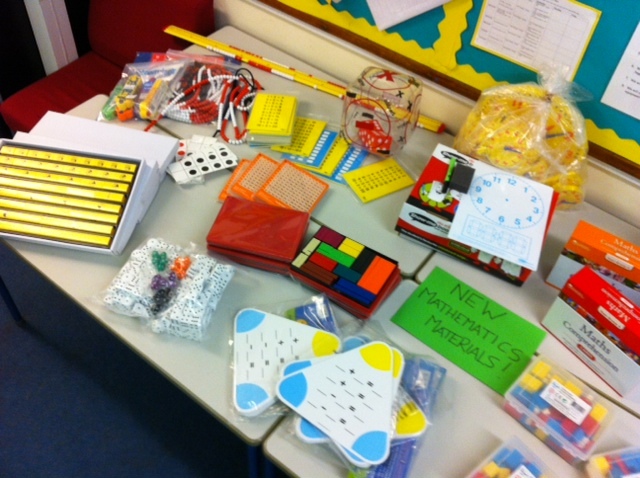 Children were able to use concrete materials which helped them to become more familiar and confident with different areas within the Mathematics curriculum. This 'hand's on' approach really does work and helps children to understand key concepts and demonstrate their learning. The new equipment (recently unwrapped!) builds further upon our previous work and will continue to support children in their learning through the use of practical equipment that is engaging and fun to use.